This throw ranks as number two in the big contest throws. The reasons for this is that there is nearly always an opportunity for it. 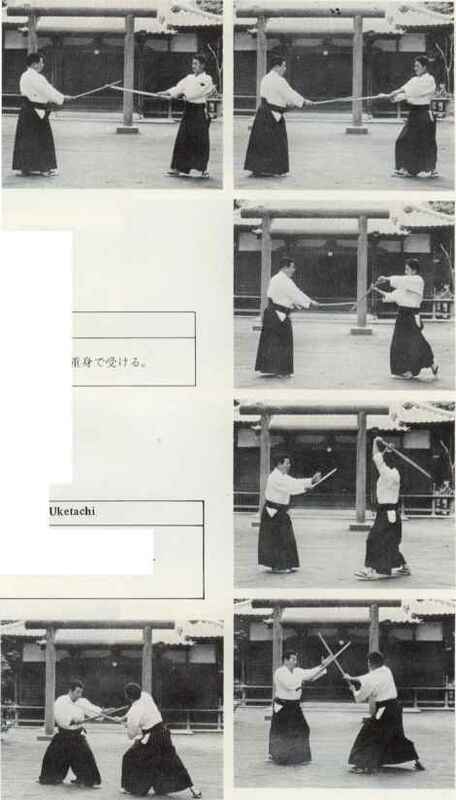 Secondly, it can be done very quickly and thirdly, once in position, it is very difficult for the opponent to escape. Also the man who uses o-soto-gari can apply a lot of power for forcing the throw through even if he is only partially in position. Study the photographs. You will see that the attacker has swept his partner's leg off the ground with his right leg and is throwing him to his right back corner. The moment for this throw is when your opponent's right leg and side are forward either when he is stationary or moving forward or backwards. Stand with your partner in the natural posture. In order to sweep the opponent's leg successfully step with the left foot out to his right side and close to his right foot. Instantly the right leg follows through sweeping in an ellipse against the back of the opponent's leg. To complete the throw sweep vigorously back with right leg scooping both of the opponent's legs up and dropping him on his back. As in all these throws where you take away an opponent's legs, you must make sure that his weight is on the leg. Notice in plate 161 that my opponent's left foot is almost off the mat. In this throw the arms and shoulders push the opponent back and over his right leg. The action of the arms is not isolated. They start working before or at the same time you step out with your left leg. This throw is my particular favourite. I've studied it for a long time and have come to the conclusion that the action of the arms is most important especially the right arm. This throw seems deceptively easy. One reason for this is that it is easy to move the feet quickly and get the right leg almost in position. For this reason everybody tries it. However, because of bad arm work in the majority of cases, it rarely comes off. With his right leg in position, it is often possible for an experienced man to hop forward until his arms come into play and with further hopping and hooking with his right leg force the throw through. However, to move in quickly and throw the man on the spot needs positive armwork. Look carefully at the arms in the plates.